Ryumochnaya was similar to pubs in England, as a place where career professionals might go after the end of a hard day’s work. Source: Kommersant. A “ryumochnaya,” or shot-glass bar, was a particularly Soviet kind of vodka den found specifically in Leningrad. London may have its pubs and Moscow its beer halls, but the dour drinkers of present-day St. Petersburg have always downed their drinks in vodka dens. The onset of winter comes in November and hangs over the city until late April. A pervading wind blows in from the Gulf of Finland and the streets are covered with slush. The best method for moving along the streets is in a series of spurts – a rapid sprint from the warm lobby of the metro station to a bookshop, or a neatly timed dive into a shop selling tin soldiers. A ryumochnaya – a vodka den of refuge, where one can grab a hot bite without fear of unwanted chat from other denizens – rescues the perishing like an oasis in the desert. It is tidy, quiet and cheap here. Everyone observes a respectful silence. When they are done, with one wave of farewell, customers sprint onwards; home, to friends, or to the Philharmonic Hall. Vodka dens were unheard of in early Russia. Their function was instead performed by inns, beer taverns or restaurants – each establishment appealing to its own social class. This all came tumbling down in 1914, with prohibition at the onset of WWI. These establishments did not reappear until 1925, after the dust of the Russian Revolution and Civil War had settled. Unfortunately, Leningrad's drinking establishments were only miserable shadows of their pre-Revolutionary counterparts. Lined up at their bars, swindlers, petty jobbers and crooks were all to be found – along with a few respectable visitors. It seemed as if Stalin's five-year plans had put an end to the idea of drinks and hors d'oeuvres. The situation was only salvaged by a happy conflation of two of the Soviet leader's more fortunate quips: “Living has become better, and living has become happier,” along with “The ranks will fix everything.” According to these prescriptions, the upper castes of Soviet society deserved something better than what mere mortals might aspire to – specifically, they deserved restaurants. Here generals, academics and People's Artists ordered courses from the famous Book of Delicious and Healthy Food. Still, the working class also deserved to have some enjoyment in life. Hence, buffets, snack bars, “beer & soft drinks” and, finally, vodka dens (ryumochnaya) appeared by the late 1930s. One great principle underscored the rationale behind these multifarious outlets – to teach people how to drink politely, with hors d'oeuvres, and under the watchful eye of their custodians. The golden era of the vodka den bloomed in Leningrad in the years following WWII. Writer Valery Popov reminisces: “The vodka dens were places for meet-ups, chats, dates, networking – of course, not only for law-abiding citizens but also for the criminal fraternity.” For every level of society, the important feature of post-war vodka dens was accessibility. Attractive restaurants were off limits to the huge majority of the populace. Hence everyone, from military officers to students, from street-corner loiterers to the most valuable employees, huddled around circular tables with fake marble table tops. Many of the norms of Soviet existence entered the 1990s as bizarre and depressing self-parodies – nostalgia clad in an overcoat of irony. The most peculiar thing was the appeal that pseudo-Soviet eateries had amongst foreigners. The old vodka dens were not rebuilt or restyled, nor have they disappeared. As symbols of St. Petersburg they continue to fulfill their time-honored function. 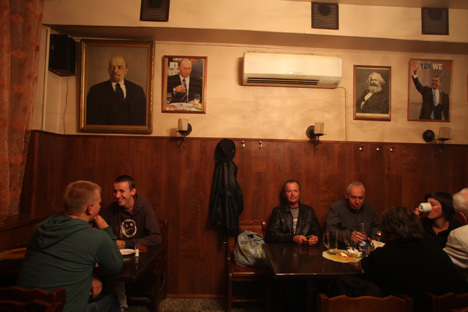 People stand up to drink in a typical vodka den, putting their drinks and plates on the counters running around all the walls or on the tall circular tables in the center of the room. People mostly drink vodka; there is little demand for cognac or fortified wines. The main dish on the menu, of course, is the open sandwich. Order is maintained by intimidating women – often of Tatar descent – who know the regulars and their habitual orders by heart, and quickly intervene to prevent any disturbance to established norms. The regulars also greet any loud voices from overindulged drinkers with sullen stares; they may even assist in heaving out unwanted clientele. In fact, once a regular becomes a known and trusted patron of the establishment, they receive credit at the bar. Most regulars are pensioners, and almost all have grown up with the culture and tradition of the vodka den. It is true that customers nowadays no longer come in with their coworkers; more often, they meet their old classmates or their neighbors. One might bump into pensioners, engineers, lecturers, chauffeurs, auto repair men, physics teachers or sports coaches. Many patrons are unhappy with their daily lives and political beliefs tend towards old-style communism. Vodka dens cannot be made fashionable. There have been many attempts at this, trying to create a genre of drinking place for a younger and more affluent clientele. Such attempts have all ended in failure. The younger generation does not have the capacity for hard liquor that their fathers or grandfathers had, and they do not have the same kind of passion for vodka. Local hipsters instead prefer to drink shots in some trendy bar – most likely near the old Duma building, or along the Fontanka embankment. The old vodka dens still carry out their trade, but they are dying out alongside the clientele they serve – they are going the same way as broadsheet newspapers, or playing dominoes in the courtyard. The full version of the article in Russian was published in Ogoniok Magazine.